Filled with music from the 50s and 60s, 'Dreamboats and Petticoats' is stylish, slick and fun. Back in 2007, Dreamboats and Petticoats released as a compilation album filled to the brim with rock n’ roll music from the fifties and sixties. After 4 sequel albums, D&M launched as a jukebox musical in London’s West End and eventually began touring the country. Following the story of Essex youth club in the 1960s, the plot revolves around a song-writing competition for the area’s young musicians. However, it isn’t the plot that made the show a success, as is typical of a jukebox musical, it was of course the music. In the same way that Mamma Mia was written for ABBA fans and Our House for Madness fans, Dreamboats and Petticoats is purely written for 50s and 60s music lovers. Again, like Mamma Mia and Our House, the plot is fairly watery and predictable, providing no substance to the show whatsoever. Boasting an impressive 45 musical numbers (compared to your typical West End musical’s 20, give or take), it is clear that the plot is just a vehicle to carry the hefty number of songs. The show certainly doesn’t take itself too seriously. It is something of a pastiche, reflecting every cliché you’d expect from 1960s culture: a character rocking an Elvis look, giant skirts paired with spotless white plimsolls and a set covered with posters reminiscent of a better time. This is where the show really sells itself to its audience, either as a two and half hour nostalgia-fest for those who lived through the era (these people making up most of the audience), or a blast from the past for younger generations who enjoy the unmistakable style of 50s and 60s music. With this is mind, Dreamboats and Petticoats is an exceptional production, its success reflected not only in the audience turnout on opening night, but in their obvious enthusiasm for what was being performed on stage as well. With what little plot there is centring around singers and a band, it was lovely to see that all of the music was played live on stage, leaving no need for a pit orchestra. The actor / musicians touring with this production are clearly very talented, executing the music perfectly while maintaining the cheerful vibes the music demands of them in both their body and facial expressions. While there was very little character development, nor any audience investment in their stories, the leads Bobby (Alistair Higgins) and Laura (Elizabeth Carter) were perfect for their respective roles. With the hefty amount of music, the show could easily have felt sluggish and slow, but they carry it with just the right amount of gusto and kept the audience entertained throughout. It is on its entertainment value that this show makes its money. 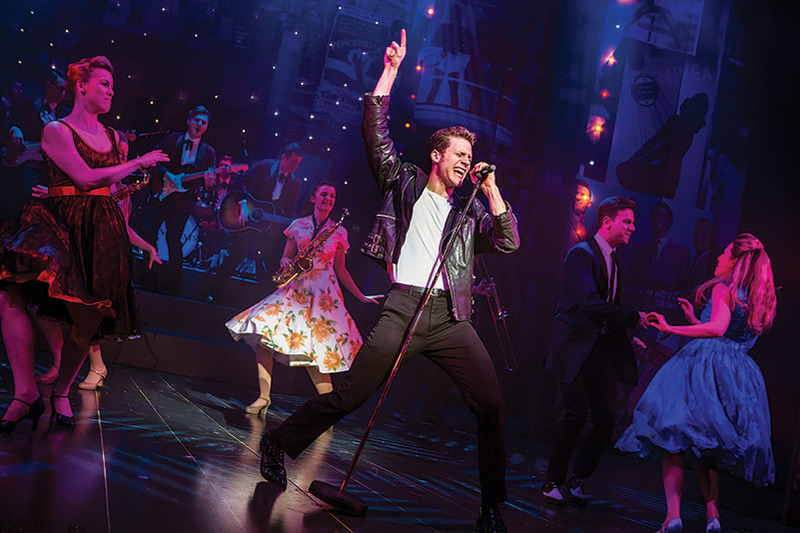 The bright lights, loud music and slick performances is what you pay for, and if rock ‘n roll is your thing then you will undoubtedly love Dreamboats and Petticoats. Just don’t be surprised when you’re expected to stand up and dance at the end! Dreamboats and Petticoats was at Southampton’s Mayflower Theatre from the August 22nd to the 26th.